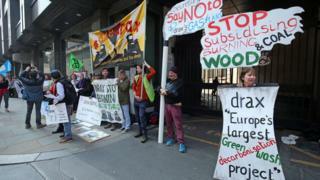 Forty environmental protesters demonstrated outside the annual meeting of the energy firm Drax. Drax operates the largest biomass-fuelled power station in Europe, near Selby in North Yorkshire. The company gets government green energy subsidies, but the protesters say burning biomass at Drax produces as much carbon as burning coal. They plan to walk from the London AGM to the Department for Business, Energy and Industrial Strategy. Duncan Law, 59, a campaigner from Biofuelwatch, described the current set-up as "an obscenity". He said: "We say we need to be dedicating all our intelligence, Drax's included, to achieving a genuine transition to a low-carbon future. "At the moment, we need the money that's going to them to go to a smart, decentralised, democratised, genuinely low-carbon electricity energy system."